First off: 'Bout the colors, I wanted to make a whole light grey marathon, as you can see, i started on the front half, it's light grey. But besides the color. It's the BIGGEST, most ENORMOUS thing i ever posted (or made). The Belly of the beast, man now i tihink about the Domino's Pizza commercial 'man hungry, ding dong pizza', but whatever. I got more pics on my PC, just too lazy to put 'em up. That barely looks like ANY ship from halo. It looks more like some large, deformed brick made of legos. This is the problem with legos: the results never look like the actual thing, because you're building the "model" out of arbitrarily shaped pieces of plastic. Quoting spartan 189 Good, but it isn't "Marathon." 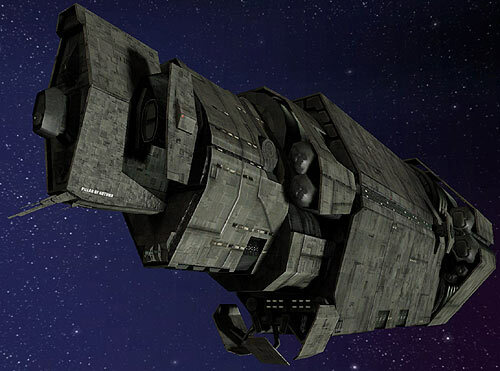 It's actually a Halcyon-class cruiser, just like the Pillar of Autumn. Good, but it isn't "Marathon." It's actually a Halcyon-class cruiser, just like the Pillar of Autumn. Thank you =D, I think i got all those grey plates from the city planes, oh yea, it COULD use some detail, i broke it, it was too fragile, i made a custom frigate with the pieces.